For help on finding or creating a resource pin, please see our Help articles, Find and Add a Resource Pin or Create a Resource Pin. Click on Maps. Open the curriculum map you want to add resources to. 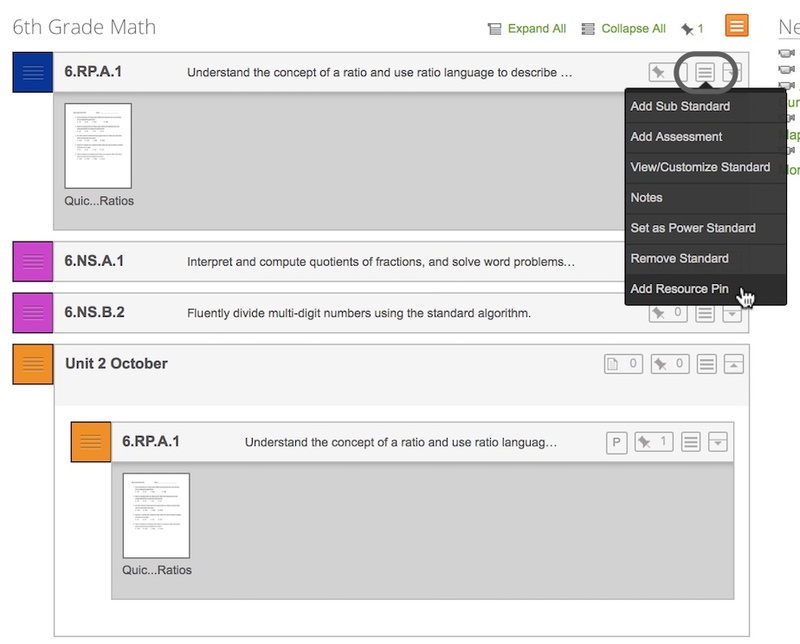 On your curriculum map, you can add resource pins to units, standards, or to the entire map. Hover over the menu button for the map, unit, or standard and click on Add Resource Pin. Click on Search Community to find a resource pin in the community, or click on Create a New Resource Pin to upload a pin from your computer or the internet. Note: When you search the community for a resource pin, the search results will be sorted to include the standard or standards you're adding the resource pin to.